And Now For Something Completely Different….Whatever happened to The Silverfish King? NOT cute or cartoony at all, is it? Back in the day, (The 1970’s), when cable tv, including HBO was a shiny new thing sweeping the nation, as kids we were pretty thrilled to have more than three channels in our house. In those days, HBO would show some really oddball weird stuff. I vividly remember a feature length animated film about life on a distant planet. With some pretty disturbing images. If I could just remember the name of it, maybe I could post a few pics of that. 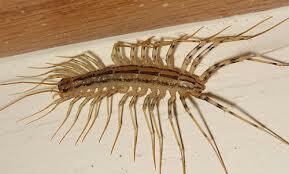 But the thing that has really stayed with me is The Silverfish King. A very strange little short animated feature. It was about a cute and cuddly little silverfish king, complete with a crown. He had a girlfriend named Spanga, who was some other type of bug. A ladybug, maybe? I just can’t remember. The Silverfish King would carry her across the river on his back while she sang “Oh you red hot firecrackers! Oh you red hot firecrackers!” Just tell me that isn’t weird. I don’t remember the rest of the story, or why Spanga needed to be hauled across the river in the first place. That stupid refrain is one of those things that for some reason the human brain seems to latch onto until the end of time. I have had the little tune pop in to my head on a number of occasions in the years following my childhood viewing of this little short film. It has become somewhat of a family joke. More than once, I have missed a phone call from one of my siblings, only to listen to a resulting voice mail that was simply the words “Oh, you red hot firecrackers! Oh, you red hot firecrackers!” sung to me from across telephone lines. Followed by either laughing or just a hang up. In truth, I’ve done it to them too. Why does something so seemingly odd and random have such adhesive qualities? I’m not sure that we even saw it more than once. I have tried and failed to find this film on the interweb. While it seems to be listed in a number of film databases, I can not find any pictures, a copy to view or much information at all about it. It’s like it was here and gone in an instant. Just sticking around long enough to take up space in the impressionable mind of a mid-western 12 year old girl. Does anyone else know this odd little film? Does anyone else remember the endearing Silverfish King and his delightful lady friend Spanga? Do you have something from your childhood that seemed so insignificant at the time, but for some reason you are still carrying the memory? I’d love to hear it. I am threatening duct tape on my computer monitor to cover that picture. What an ugly bug! My childhood nickname was Beanie. The story is my brother, ten years older, started calling me Jeanie Beanie, and it stuck. Not everyone in the neighborhood knew who Jean was, but they all knew Beanie, the little towhead down the street. Well the boy who lived behind me, a really good friend for many years, used to say “Hey Beanie, where is Cecil?” I never understood what he was talking about. I guess it was an early t.v. show. It was before our time. I’m not sure how he knew anything about it. Even now, as I Google it, I don’t remember anything about it. Sorry about the ugly picture. I couldn’t do a whole post without a picture of something, could I? He is ugly, though isn’t he. Don’t even get me started on childhood nicknames. Ha ha. I had quite a few, and am still called by some, even though I’m an old lady now. Okay, you kids just cut it out. I haven’t had time to Google this yet. I have a job ya know! Okay, I got it figured out. Sort of. The dinosaur is Barney’s cousin, and the little boy is Elroy Jetson, who’s been sent back in time with one of the machines at his dad’s company, Spacely Sprockets, right? I’m still confused as to which is Beanie and which one is Cecil, so henceforth, I shall simply call them Barney and Elroy. And thank you all for the opportunity to use the word “henceforth”. It’s one of my favorite words. Second only to “incredulous”. I checked and it was Beany and Cecil -started out as a puppet show, then became a cartoon. I’m not even sure this is really a sivlerfish. It doesn’t look like the bugs I’ve seen in old books that I was told are silverfish. But what do I know? What I usually see is crickets. Big ones. My dog loves to snack on them-barf-whenever she can catch one. I could devote an entire post to gross things my dog does, but I will spare everyone. I haven’t written anything about her for a while. Maybe she’s due for a little interview when she’s not busy chasing tennis balls or going to puppy-garden. Haha, I’ll look out for it! I can’t think of anything from my childhood, but I hope our kid gets over one we foisted upon him. (Like foisted?) Many Christmases ago, my nephew barked out of nowhere, “Get down on the floor and make me a pie.” I think it was a tortured South Park reference. Me, hubby, and the boy now say this *all the time* and in reference to anything we are asking of the other. I know. It doesn’t take much here to entertain us. We do stuff like that all the time too. The other night my husband asked me a question, I don’t remember what it was, but my answer was “Pretty much.” I don’t know what was in his ears, but he thought I said “Cran mark”. Oh my god, we laughed so hard I thought we were both going to puke. So now, Cran-mark is the word du jour around the house. I can see that. They sound so much alike. 🙂 I love word du jours. …then there’s the part where he struggles to drip orange poison juice into the ear of the evil banker…but I won’t give away the surprise ending. Yep, I, too was enchanted by the weirdness of the Silverfish King on 80’s cable and have wanted to see it again. As far as I can tell, it only still exists on film (probably 16mm) and in only a couple of film archives–the School of the Art Institute of Chicago and the National Film and Sound Archive in Australia. It was originally distributed by Films, Incorporated, but they’re out of business, and their stock went to Kit Parker Films, who doesn’t list it on their website (but you could E-mail them if you’re really determined). Wow! You’re the first person who has stopped by to even say they’ve seen it. Thanks so much! There was another one, a full length animated feature. Something Planet, can not remember the name. That one is just plain weird too. I saw it on HBO as well. The people were bald and blue. Does that one sound familiar? I too remember this HBO ‘short’. My sister & I found it very disturbing… I recall the ‘ear’ incident. As for Beany and Cecil referenced above, here’s a You Tube video of the original opening titles; very loud, showmanlike, and fun 60’s style, even including the show’s producer (Bob Clampett) in animated form. It’s a reeeallly raw transfer from an old black-and-white 16mm print, but it’s great stuff. « The first ever Cheeky Diva Awards!